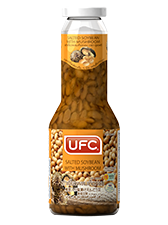 UFC Salted Soybean is unique because it is produced purely from whole grade A non-GMO soy beans. The quality of soy beans filled with proteins, flavour and fragrance, is then marinated with traditional methods. We offer two varieties, original UFC Salted Soybean and UFC Salted Soybean with sliced shitake mushrooms. Both salted soybean variants are ideal to cook in all types of dishes, whether it be stir-fried, boiled, baked, gravy topping or dipped. This product does not contain any preservatives and is cleanly sealed in certified packaging. It is ideal for both vegetarians and vegans.